Tsubaki of Canada is excited to announce our presence in social media! Learn more about our products and services as we share and exchange information about anything and everything! Don’t miss out and be in the loop for a chance to win one of five $50 Future Shop gift cards! It’s easy……..
Like us on Facebook, follow us on Twitter, add us on Google Plus or subscribe to our YouTube channel! Do one or do all for more chances of winning! Tsubaki would like to thank all those who participated in our customer survey. Congratulations to Kevin C, Laurina Mackinnon, Jim Tiegs, Kelvin Roberts and Gaston Lapointe. We’ve heard your voices and we’ve taken action to improve our service level to your full satisfaction! Stay tuned for more details as we unveil to you the best service in the industry. 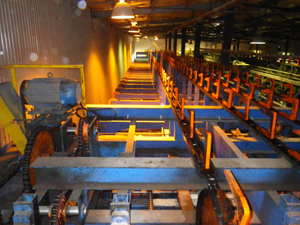 Issue: The sawmill customer was experiencing abnormal shock loads on their lumber sorter. To protect his equipment from breaking, they had installed shear pins that would break before the equipment would. This solution required him to spend a lot of maintenance time as these excessive shocks were happening on a daily basis. Not to mention the downtime as they had to stop the production as they change the shear pins. Tsubaki Solution: Tsubaki recommended the use of shock relay. Whenever the application is encountering an irregular jam situation causing the potentially destructive shock load, the shock relay senses the power surge and shuts down the motor quickly, safely and securely before any damage occurs. After the problem is corrected, the shock relay can be easily resumed with a simple press of the reset button. No tear down is required. That means improved efficiency, reduced downtime and big savings both in time and money. Cost saving: With lost production and maintenance time saved, the customer is saving over $6,000 annually with the installation of shock relay. Do you have a problematic application that is subjected to high speeds, high shock loads and high cyclic loading that put great demand on your roller chain? Count on the experts at Tsubaki to deliver Energy Series – the chains you need to keep your operation running smoothly. Made in the USA and API approved this chain is typically used in Oilfield applications. 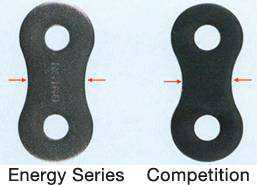 Energy Series link plates have a wider waist than our competitors which extends fatigue life and stands up to the maximum shock loads. In addition, the plates are precisely heat treated and shot-peened to increase tensile strength. The link plate holes are ballized to impart residual compressive stress and create extremely smooth hole surfaces. This allows for a tighter fit which maximizes fatigue strength. Multi-strand Energy Series chains have pitch compensated middle link plates which create a contact fit that allows for easy cutting and assembly while maintaining tensile strength. The plates hold tighter and share the load equally, creating higher fatigue resistance and longer lasting chain. Energy Series bushings and rollers are designed to be the toughest in the industry. Solid rollers are cold formed from high grade steel then heat treated and shot-peened. The bushings are fabricated to optimize roundness with solid bushings for large sizes and precision formed bushings for small sizes. 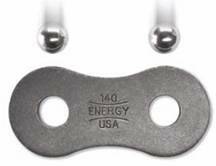 The pins on the Energy Series chains are through hardened and precision ground to improve fatigue life and decrease the effects of shock loading. All Energy Series chains use specially designed Z cotter pins to minimize vibration, yet allow easy assembly or disassembly in the field. The final manufacturing step before chains are shipped is one of the most important. Tsubaki dips each chain in hot lubricant, so it penetrates deeper than typical surface sprays. This special step puts the lube where you need it – deep into the pin and bushing area – to extend the working life of the chain.